I appear to be starting a Coneysthorpe tradition - making a new Matryoshka doll each New Year. The one I made last New Year was purchased and sent to the UK as a gift. So here is 2016's lady, Oxana. 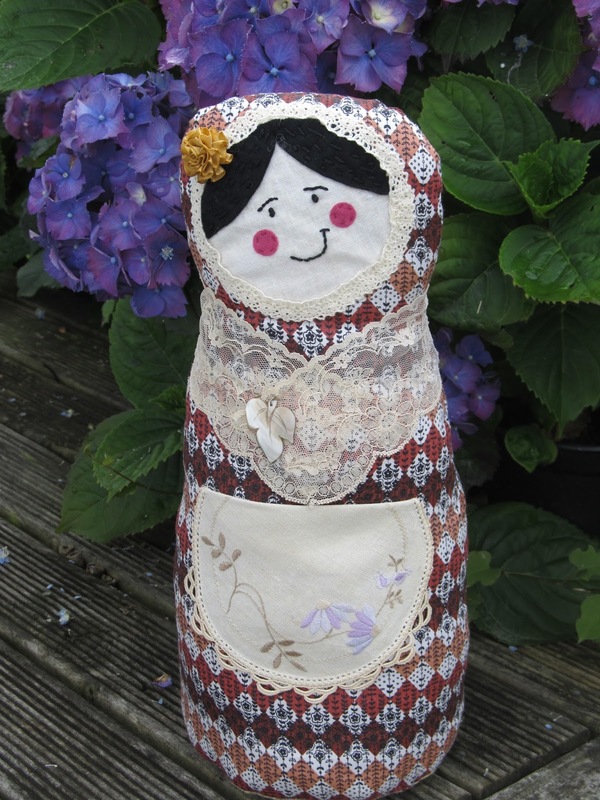 She is made from 1950s cotton and old lace. I had a run of doll purchases before Christmas and only had one left, looking a bit lonely in the spare guest room. So Oxana will be a companion, until she is sold too. Oxana narrowly avoided being photo bombed by our resident diva, who was watching a bird very closely on the lawn. As the rain has come (thank you Lord) forays into the garden are out of the question, so this afternoon will be making plum desserts for friends. Wishing you all a lovely start to the New Year.